Why are you advocating for high-speed passenger rail service through Rochester? Discussions about developing inter-regional high-speed passenger rail have been gaining momentum at the federal level and regionally in recent months. Increased pressure on the nation’s transportation system, higher fuel prices, environmental concerns and problems within the airline industry have generated some urgency around finding new transportation solutions. With a Chicago to Twin Cities route already under consideration, we want to capitalize on the opportunity by making the case for service through Rochester as the best route for that proposed corridor. Why is Rochester the most logical choice? Rochester is Minnesota’s third-largest city with more than 100,000 residents, and its projected to continue this growth for decades to come. Rochester is the largest economic center between Madison, Wisconsin and the Twin Cities. Rochester employs nearly 110,000 workers, and from 1998 to 2008, the Rochester area economy added jobs at twice the rate of both the state and nation. Rochester is home to the Mayo Clinic, Minnesota’s largest private employer with more than 32,000 employees in Rochester, and another 13,000 employees who work for Mayo Health System in 70 Minnesota, Wisconsin and Iowa communities. How does opposition to the DM&E coal train proposal impact advocacy for passenger rail service? We believe that regional high-speed passenger rail service offers economic benefits to the citizens, employers and communities throughout southeast Minnesota. As Rochester-area leaders have stated previously, the DM&E proposal is a significant safety concern due to the potential of a derailment, especially involving hazardous materials, in the heart of Rochester. Is it reasonable to assume that Rochester would be the preferred corridor versus other passenger rail corridors, such as a route along the Mississippi River? There are advantages and disadvantages to any proposed route. However, given that siting a high-speed passenger rail line will be a multi-generational decision, we believe the routing decision needs to be made based on which route serves the most people, offers the greatest public benefit and has the best chance of financial viability. A route through Rochester is the most logical because Rochester is the regional economic hub of southeast Minnesota. It is expected to continue its strong growth (economically and population) for years to come and already has a strong base of travelers with Rochester as their destination. This route would not only have direct benefits to Rochester but would also serve major employers and the general public throughout southeast Minnesota. How will high-speed passenger rail service impact the Rochester airport? With current high fuel prices and consolidation in the airline industry, flights between regional airports in smaller markets are potentially at risk. Inter-regional high speed passenger rail may provide an alternative to such “short hop” flights. In addition, depending on the route, regional airports could be linked to major airports by passenger rail to relieve congestion and improve efficiency of the major airports while taking advantage of existing capacity at regional airports. There are a number of other transit corridors being explored in Minnesota, such as a rail line to Duluth – how is a Rochester line impacted by the other proposed services? We are encouraged by the interest and enthusiasm for expanding Minnesota’s passenger rail infrastructure. We don’t view the Rochester route as being in competition with a Duluth line or any other line – instead, we see movement toward these investments as a clear indication that passenger rail will be a critical part of connecting and serving major population and economic centers as a vital part of a broader statewide transportation plan. Are there any plans in place/being developed for Rochester rail? The Minnesota Department of Transportation (Mn/DOT) is responsible for developing a comprehensive statewide rail plan this year. 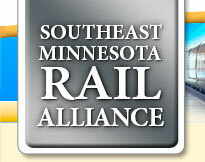 The Southeast Minnesota Rail Alliance is involved and will be working to ensure Rochester’s inclusion in the plan. When can the public realistically expect to have passenger rail serving the community? Everyone should understand that efforts to secure major infrastructure investments, particularly those at the multi-state level, are long-term processes. High-speed passenger rail service through Rochester is part of a long-term vision for the community; it will not be a reality for several years. What route would a high-speed passenger rail line take through Rochester? How much will it cost? At this time, it is too early to speculate about the specifics of a route or projected costs. Assuming the initiative continues to move forward, we will need to retain experts to help identify options that will provide the most benefit to the state and region and to provide more details to answer these questions. Have you done a cost-benefit analysis of a Rochester corridor? No. As this process continues, especially as we start to seek federal and state funding, these studies will be required. How will a high-speed passenger rail line be funded? We do not have a specific funding proposal at this time – it is far too early in the process. However, we know rail projects are typically funded through a shared commitment between the federal government and local (state and/or regional) governments. As other specific elements of a high-speed passenger rail proposal are developed, we will be in a better position to determine the balance between federal, state and local funding commitments.